RedBeam Check In/Check Out software completely automates the process of issuing and returning items for short or long-term use to employees, customers, students, or members. Simply print barcode labels for your inventory items and user IDs. Use a handheld barcode scanner to scan recipients' ID numbers into the Check In/Check Out software database, then scan circulating items to tie them to recipients' ID numbers. Rental fees can be charged at the time of check out and overdue fees can be applied when items are returned. Print or export a variety of built-in reports to track item usage trends, rental income and late fees. Check In/Check Out's reliable database is built on the Microsoft SQL MSDE platform, offers role-based user security, and data backup features. Network ready, Check In/Check Out software is available in both a Standard and a Mobile Edition. 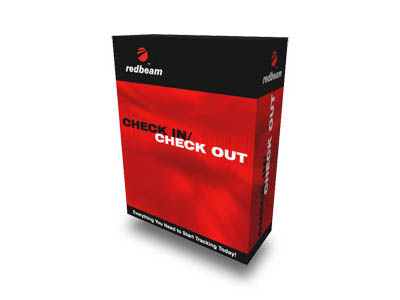 RedBeam's Check In/Check Out software is an affordable, intuitive tracking system for businesses of all kinds that need a solution for managing checked-out items. This software ships with paper laser labels. If you need to attach barcode labels to ID badges, be sure to call us for more labeling solutions. Find it faster! Click here to compare Check In/Check Out models by feature.